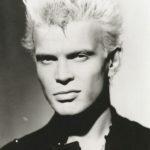 William Michael Albert Broad known professionally as Billy Idol, is an English musician, singer, songwriter, and actor. He first achieved fame in the 1970’s as a member of the punk rock band Generation X. Subsequently, he embarked on a solo career which led to international recognition and made Idol one of the lead artists during the MTV-driven “Second British Invasion” in the United States. Idol began his career in late 1976 as a guitarist in the punk rock band Chelsea. However, he soon left the group and along with his band mate Tony James formed Generation X with Idol being the lead singer. "I love it when someone insults me. That means that I don’t have to be nice anymore." "It doesn’t matter about money; having it, not having it. Or having clothes, or not having them. You’re still left alone with yourself in the end."